What am I missing here? OK, cost to skill is good, and you have terror and high toughness to make it hard to take down. But without other icons it isn't going to do enough alone, and then that nasty response kicks in. The one place I see this working is a Gug deck, where you actually want to take wounds. Beyond that I'll pass. Gugs don't want to be taking multiple wounds at a time, if it did 1 wound then maybe it would go into a gug deck but at 2 wounds it does more harm than good. What would happen if a wound from this effect was cancelled? Ward Phillips would protect from that wicked Forced Response, but I still don't think the juice is worth the squeeze. The Basilisk is pretty much unplayable in my opinion. A shame too because I think it's a pretty cool card. Basilisk seems like the quintessential Shub card. High cost, high skill, redundant icons, Toughness. The wounding effect would facilitate your graveyard recursion abilities, although it might do so a little faster than you'd like! 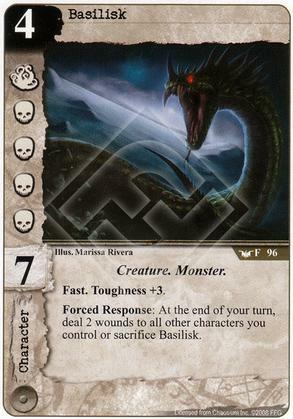 Basilisk should've been a Shub card, in my opinion, but there's probably something in the Dreamlands stories that made it Neutral.